My dear daughter-in-law made some refrigerator pickles a few weeks ago. I was inspired to try my hand at it, as well. SO easy and they are delicious. 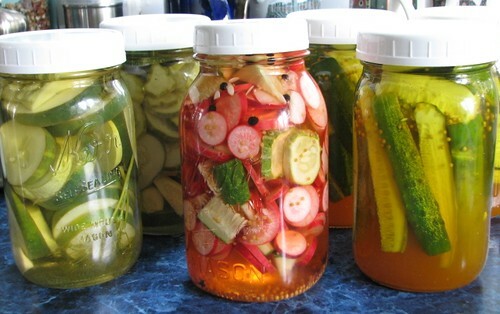 I made two jars of dills slices, three jars of sweet pickle spears and a jar of pickled radish slices with a few cucumber chunks thrown in to fill the jar. The sweet pickles were first, as DH likes those the best. I used the Summertime Sweet Pickles recipe from allrecipes.com, though I left out the onions (DH is allergic to onion…I know! How sad is that??). In a small saucepan at medium-high heat, combine cider vinegar, salt, sugar, tumeric and mustard seed. Bring to a boil and let cook for 5 more minutes. Meanwhile, slice cucumbers and onion. Loosely pack the vegetables in a 1-quart canning jar or other similarly sized container. Pour hot liquid over the vegetables in the container. Refrigerate for 24 hours and enjoy! Keep refrigerated. This recipe made three quarts for me. So easy! And they taste good, too! Yummy right out of the jar. 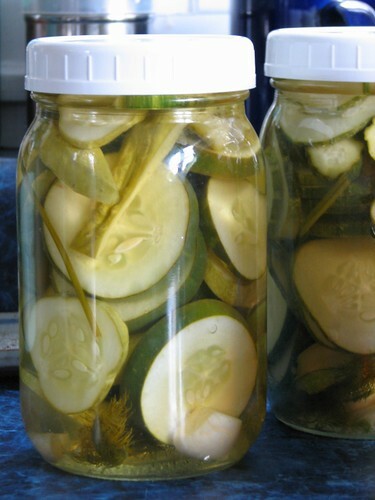 For the dill pickles, I used this simple recipe, Overnight Pickles, from cooks.com. I made thicker 1/4 inch slices for one jar of chunky pickles and sliced the cukes for the second jar more like 1/8 inch thick. Cut cucumbers in halves then in quarters (I sliced them). Place in a jar with dill weed. Boil water, vinegar, garlic and salt. Pour over cucumbers and refrigerate overnight. Keep refrigerated. These are great on sandwiches and kept a good crunch, too. I made two quarts with the dill pickle recipe and had two cups of brine left over. Ran out of cukes. But I used the brine and combined it with a few ingredients from the recipe at chow.com for Bread-and-Butter Radishes to make a brine for pickling the radishes. I cooked the brine and spices at a low boil for five minutes. 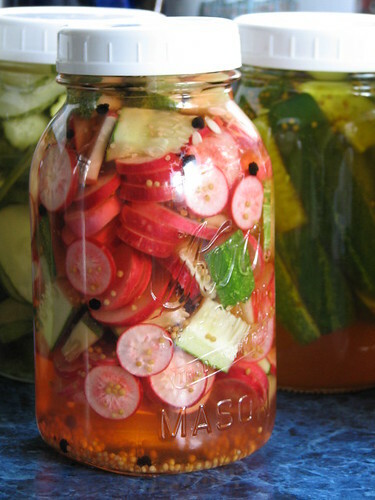 While it was cooking, I sliced radishes and chunked the few small cukes I had left, till I had enough to fill a quart canning jar. When the jar was full, I poured the brine over all until it was about 1/4 inch below the top of the jar. 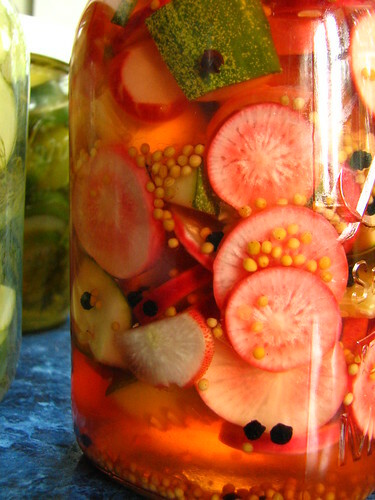 The longer the radishes pickled, the pinker they got. Very pretty in the jar! I didn’t have coriander seed, so left that out, but want to try these again following the original recipe more closely next time. These are all recipes I will try again. Give it a try yourself! 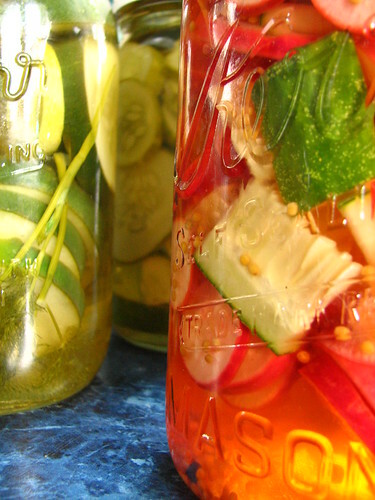 There are many, many recipes for all kinds of pickled veggies, some for the fridge and some for canning. Pack some of your surplus garden produce for later! 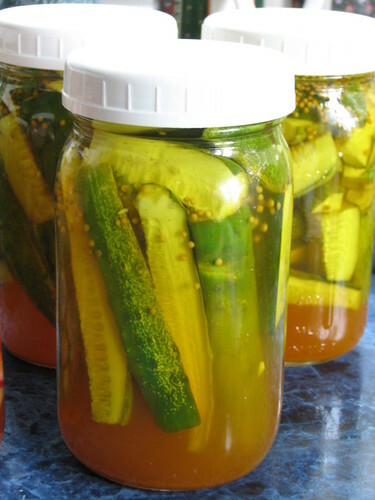 PS…for the refrigerator pickles, I used the plastic storage lids made for canning jars. Convenient when using canning jars in the fridge. Less messy than reusing the ring and flat to seal a jar of canned goods that have been opened, too. I found them in standard and wide-mouthed sizes on amazon.com. This entry was written by ~~Rhonda, posted on July 4, 2012 at 2:16 pm, filed under cooking. Bookmark the permalink. Follow any comments here with the RSS feed for this post. Post a comment or leave a trackback: Trackback URL. 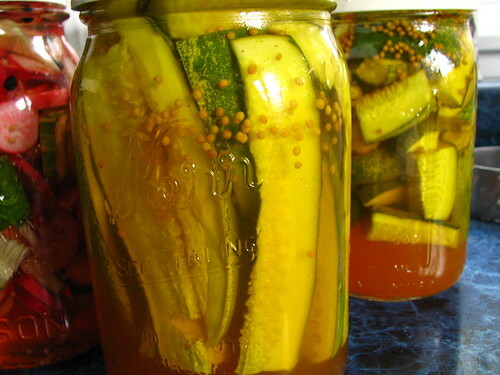 After reading this post I told my boyfriend about this and he said he was interested in trying to make these,because he loves dill pickles..A friend of my dad used to make him delicious zucchini relish with the zucchini my dad would bring him and it was ohh soo good.Still looking for a recipe for that.But my questions are..We don’t have any canning supplies,I was wondering if you can use any pot to boil the jars in?Or if your just making pickles like this do you need to sanitary them?Also for making and canning pizza/spaghetti sauce how long do you think they would last in our pantry?We are hoping to make a bunch at the end of the summer to keep stocked for the winter…I was wondering if you have any canning advice or could answer my questions..Thanks ahead of time,I love your blog..I just started one I think I sent you an email about it but not sure..